World records are set up to be broken and in this case it’s the turn of Australia to retake the world’s simultaneous burnout title. Saudi Arabia were the last to hold the the title in 2017, with 119 vehicles taking part. Earlier this month at the 2019 Summer Nationals, Australia, 126 vehicles lined up to take back the record. 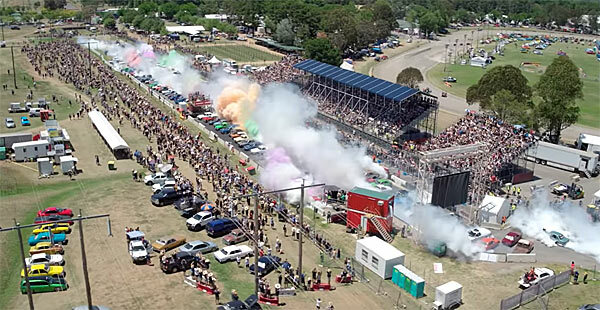 Being an Australian affair, it was lines of Fords and Holdens producing the multicolored clouds of smoke which is all spectacularly captured via drone and video footage below. Obviously, the Americans are eyeing up the title who briefly held it in 2015, being taken straight from the Australians. Organizers of the Gumball Rally has started to promote their own event to take back the title, which will take place in August this year. For now though, check out the video below of this incredible burnout spectacular. ← Previous Story Tesla vs. Muscle Car: Unfair?